The Dauphinee Centre is sporting a new look thanks to new fence signage on the build site. Installed in time for Homecoming, the signage showcases various members of the Saint Mary’s community, acknowledges donors, and helps promote the centre slated to open in time for the 2019 hockey season. The signage is designed to reflect the fact that centre will make a significant contribution not only to varsity athletics but to the wellness of our entire community, with 50% of its usage capacity dedicated to community groups. SMU varsity athletes Marc Terriault and Siobhan Birch are featured wearing their Huskies gear. Another panel pictures Tyler Naugler, Assistant Coach, Men’s Hockey with his daughter as they walk by the Homburg Centre. 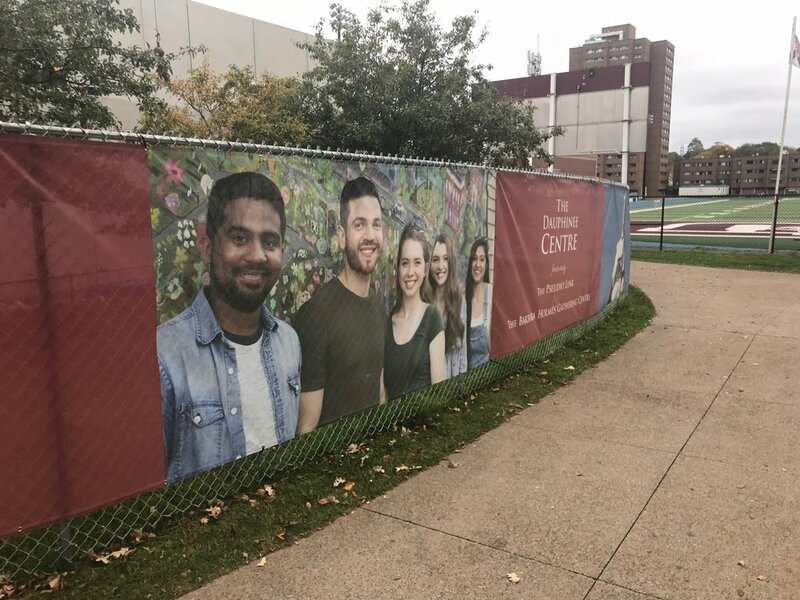 The Saint Mary’s student body is represented with a photo of students Mohammad Ashiq, Jesus Hernandez, Jillian Taylor, Ashley Brewster and Sehmat Suri. Additional panels highlight the Saint Mary’s University branding, and promote the arena name as well as the Pseudio Link and the Barbara Holmes Gathering Centre.